The base is Sahara Sand and I cut that out with the Scallop Square Bigz Clear die. I added some dots with my Basic Black Stampin' write marker. I layered a Basic Black piece and a Pool Party piece. I punched a square of the Patterns DSP Neutrals stack of Basic Black with the 1 3/8 inch Square punch. I cut a rectangle of Sahara Sand from the same Patterns DSP and a rectangle of Pool Party DSP from the Domestic Goddess DSP. I stamped the cake from Bring on the Cake in Basic Black and used Pool Party and Sahara Sand ink and blender pens to color it in. I punched a Whisper White flower with the Blossoms Bouquet Triple Layer punch. A Sahara Sand circle was punched with the 3/4 inch Circle punch and a Pool Party Designer Printed Brad is in the center. I popped up the flower with Stampin' dimensionals. Finally, some 3/8 inch Pool Party Ruffled Ribbon finishes it off. I made this quick card for the Clean and Simple Stamping FTL#159 here. ﻿ And it also qualifies for the SUO Challenge #28-Fall Colors-here. The base is Crumb Cake card stock and I added a bit of DSP from the Patterns DSP Neutrals Stack on the bottom. I stamped the leaves from Falling Leaves in Riding Hood Red, Tangerine Tango, More Mustard, Old Olive, Not Quite Navy and Rich Razzleberry on Very Vanilla and punched them all out with the 1 1/4 inch Circle punch. 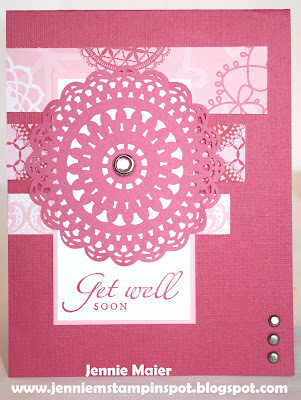 I popped up each circle with Stampin' dimensonals. I stamped Grateful on the bottom in Crumb Cake. Finally, some 1/2 inch Tangerine Tango Scallop Dots Ribbon finishes it off. The base is Cajun Craze card stock and I added some Frightful Sight DSP. I used my Coluzzle to cut out the Whisper White circle and the Scallop Circle #2 die for the Cajun Craze scallop circle. I used my Stamp-a-ma-jig to perfectly position and stamp the branch, bats and moon from Out On a Limb. Those pieces were stamped in Cajun Craze, Basic Gray and Cherry Cobbler ink. 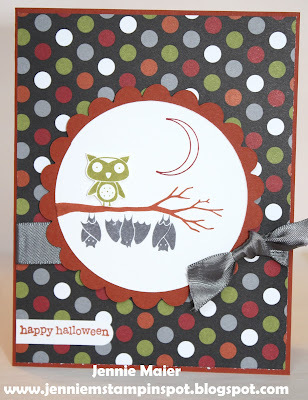 I stamped the owl in Old Olive, cut it out and popped it up with Stampin' dimensionals. 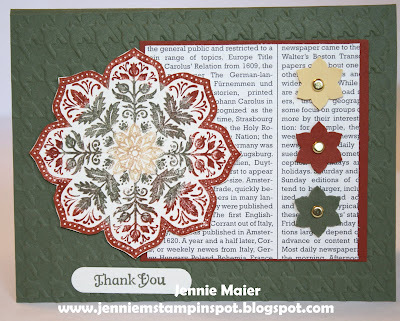 I popped up the entire scallop with Stampin' dimensionals too. Happy Halloween from Teeny Tiny Wishes was stamped in Cajun Craze and punched out with the Word Window punch. Finally, some 5/8 inch Basic Gray Satin ribbon finishes it off. My computer if FINALLY back in action! I made this quick card using the Create with Connie and Mary Sketch Challenge#168 here, and the PPA#112-CAS-Elements of Style-Lace, here. 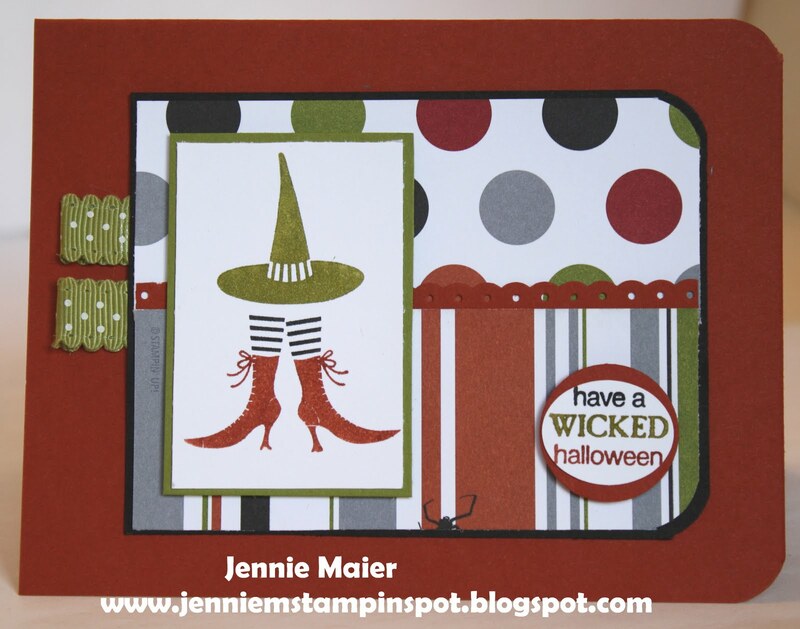 I started with a Melon Mambo card stock base and added papers from the Flirtatious Specialty DSP. I matted a piece of Whisper White with some Pretty in Pink card stock and stamped Get Well Soon from Sincere Salutations in Melon Mambo. I used a Mambo doily (my idea of the "lace" portion) from the DSP for the focal point, adding a Pink Circle Fire brad to the center. Finally, some Silver brads in the bottom corner finish it off. I made this card for the Splitcoast Sketch Challenge#351 here. The base is Chocolate Chip card stock and I added some Wild Wasabi and then some Holly Berry Bouquet DSP. I ran the rectangles of Very Vanilla thru the Big Shot with the Snow Burst textured impressions embossing folder and matted them with some Wild Wasabi. I stamped the stockings from Stitched Stockings in Chocolate Chip and Wild Wasabi and used the Stocking Builder Punch to punch them out. I popped up the stockings with Stampin' dimensionals. 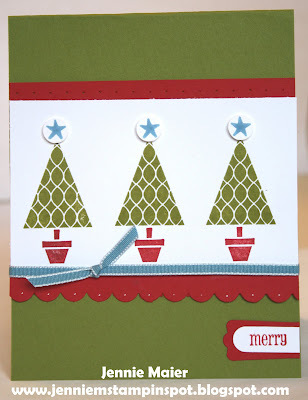 I stamped Merry Christmas from Season of Joy in Wild Wasabi and punched it out with the Small Oval punch. I layered that onto a Wild Wasabi piece punched with the Scallop Oval punch and popped it up with Stampin' dimensionals. Finally, some 1/2 inch Chocolate Chip Scallop Dotted ribbon finishes it off. This fun card was made with the Splitcoast Color Challenge#341 here. The colors are Old Olive, Pumpkin Pie and Tempting Turquoise. My base is Crumb Cake card stock and I ran that thru the Big Shot with the Perfect Polka Dots textured impressions embossing folder. 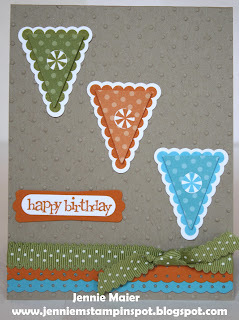 I stamped the banner from Party This Way in each color and punched it out with the Petite Pennants Builder punch. I used the punch again, but used the smaller triangle on each piece of Patterns DSP from the Brights Stack, popping up those triangles with Stampin 'dimensionals. I stamped the little circle piece from Pennant Parade in each color and used the Itty Bitty Shapes punches pack to punch out the circle. Happy Birthday from Party This Way was stamped in Pumpkin Pie and punched out with the Word Window punch. That was layered onto a Pumpkin Pie piece punched with the Modern Label punch. I used the Dotted Scallop Ribbon Border punch on the Pumpkin Pie and Tempting Turquoise pieces. Finally, some 1/2 inch Scallop Dots ribbon finishes it off. 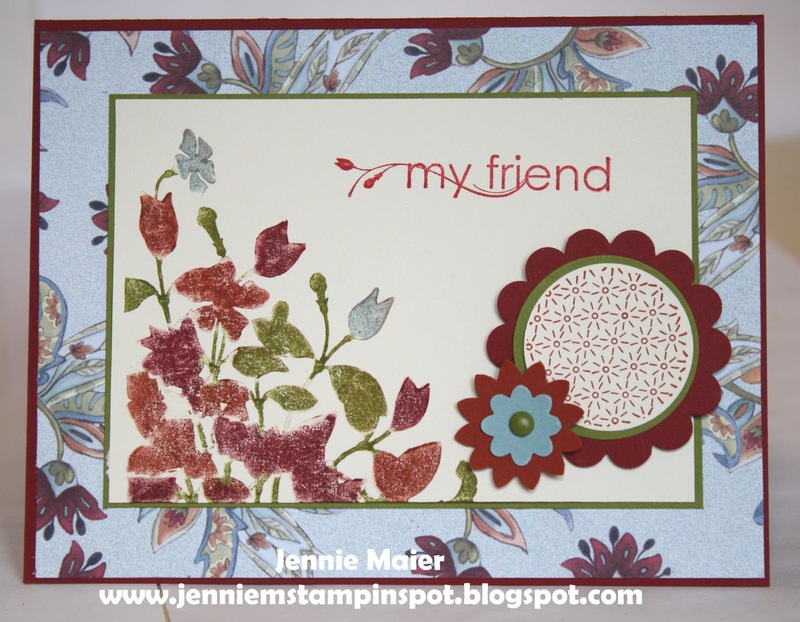 I made this card using the Stamping 411 Sketch#221 here. The base is Cherry Cobbler card stock and I added some Paisley Petals DSP. I matted some Very Vanilla with Old Olive. I used my Baha Breeze, Cherry Cobbler, Cajun Craze and Old Olive Stampin' Write markers to color in the stamp from My Friend. I used another stamp from that set and stamped it in Cajun Craze and then punched it out with the 1 1/4 inch Circle punch. I punched the Old Olive piece with the 1 3/8 inch Circle punch and the Cherry Cobbler piece with the 1 3/4 inch Scallop Circle punch. I popped those up with Stampin' dimensionals. I used the Boho Blossoms punch for the Cajun Craze and Baha Breeze flowers and added an Old Olive brad to the center. Finally, I stamped my friend in Cherry Cobbler. Here's another two-fer: I made this card for the Clean and Simple FTL#158 here, and used the Splitcoast Color Combination #340 here. The colors to use are Peach Parfait, Pool Party and Poppy Parade. The base is Poppy Parade card stock and I ran it thru the Big Shot with the Snow Burst Textured Impressions Embossing Folder. I stamped the cone, using the Pennant Parade set, in Poppy Parade. I stamped the ice cream, using Build a Cupcake, in Peach Parfait and Pool Party, then punched them out with the Cupcake Builder punch. I colored in the cherry from Build a Cupcake with my Lucky Limeade and Poppy Parade Stampin' write markers and punched it out with the Cupcake Builder punch too. I popped up the entire cone with Stampin' dimensionals. Bring on the Cake stamp set was used for the sentiment and I stamped that in Poppy Parade. Finally, some 3/8 inch Pool Party ruffled ribbon finishes it off. I made this Halloween card for the PPA#111 Sketch Challenge here, and for the Create with Connie and Mary Color Challenge#167 here. The colors to use are Cajun Craze, Old Olive and Basic Gray. The base is Cajun Craze card stock and I added some papers from the Frightful Sight DSP. I stamped the spiders from Out On a Limb in Basic Gray and used the 1/2 inch Circle punch to punch them out, popping them up with Stampin' dimensionals. I used the Owl Builder punch and some Frightful Sight DSP, Old Olive Patterns DSP and Old Olive card stock to create the owl. 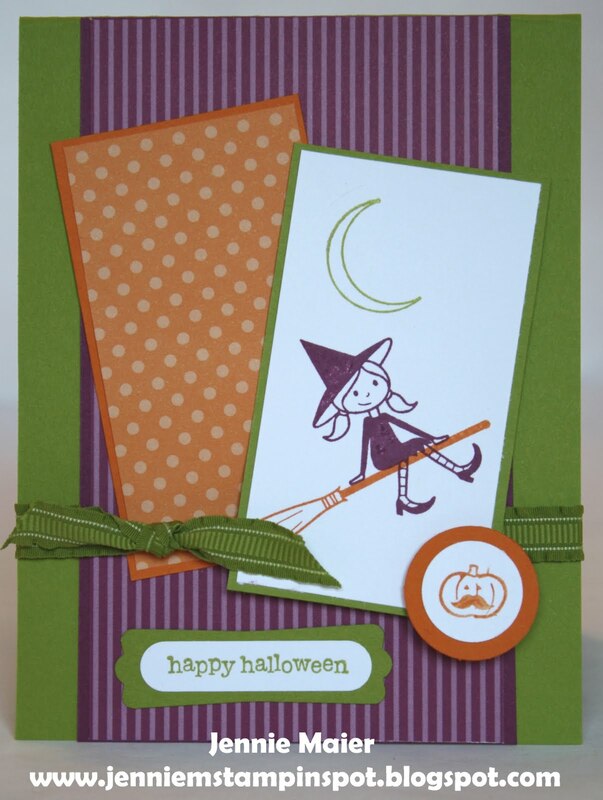 I stamped Happy Halloween from Teeny Tiny Wishes in Cajun Craze. Finally, some 5/8 inch Basic Gray Satin ribbon finishes it off. I made this card with the Splitcoast Sketch#350 here. The base is Real Red card stock and I added papers from the Big Top Birthday DSP. 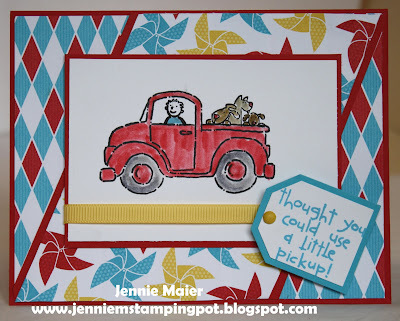 I stamped the truck from Loads of Love and the man and dogs from Loads of Love Accessories in Staz-On black. I colored in the images with my Crumb Cake, Basic Gray, Real Red, Tempting Turquoise and Soft Suede Ink pads and Blender Pens. I stamped the sentiment in Tempting Turquoise and punched it out with the Small Tag punch. I layered it onto a piece of Turquoise punched with the Large Tag punch. I added a Daffodil Delight brad to the center and popped it up with Stampin' dimensionals. Finally, some 1/4 inch Daffodil Delight grosgrain finishes it off. The base is Real Red card stock then I added some Chocolate Chip and papers from the Holly Berry Bouquet Specialty DSP. I stamped the image from Perfect Punches twice, once in Chocolate Chip and then again in Real Red. I punched out the Chocolate Chip one with the 1 3/4 inch Scallop Circle punch, and punched out the red part with the 1 3/8 inch Circle punch, popping it up with Stampin' dimensionals. I added four Real Red brads to the corners of the panel. Finally, some 1/4 inch Real Red grosgrain finishes it off. This is for the Clean and Simple FTL#157 here. The base is Peach Parfait card stock and I added some papers from the Just Add Cake DSP. I used my Stamp-a-ma-jig to stamp the tree from Trendy Trees in Chocolate Chip and Wild Wasabi. I also stamped the greeting from that set in Wild Wasabi. Finally, some 1/2 inch Peach Parfait stitched-poly ribbon finishes it off. I made this Christmas card using the Pennant Parade stamp set. I got the colors from the Inkspirations#86 Challenge here. The colors to use are Whisper White, Old Olive, Real Red and Marina Mist. 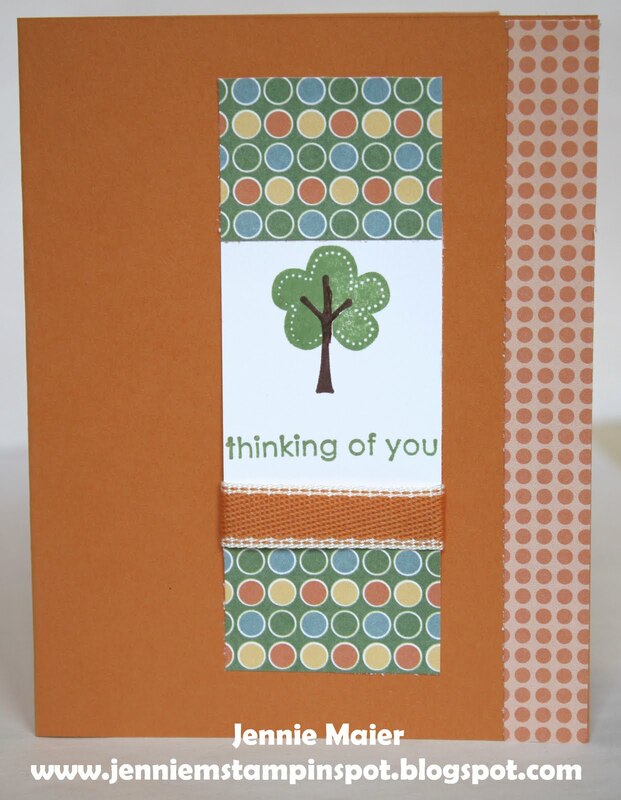 I was also inspired by Cindy Grantham's card here. My base is Old Olive. I ran some Real Red thru the Scallop Edge Border punch and added some dots with my White Gel pen. I also pierced some holes in the top piece of Real Red. I used my Stamp-a-ma-jig to position the trees and base from Pennant Parade and stamped them in Old Olive and Real Red. I stamped the stars in Marina Mist and punched them out with the Itty Bitty Shapes Punches pack. I popped them up with Stampin' dimensionals. I stamped Merry in Real Red and punched it out with the Word Window Punch. That was layered onto some Real Red punched with the Modern Label punch and trimmed down. Finally, some 1/8 inch Marina Mist taffeta finishes it off. I made this quick Halloween card for two challenges. First, the Create with Connie and Mary Sketch Challenge#166 here. The base is Cajun Craze.I rounded the two corners with the 3/16 Corner Rounder punch. I added some papers from the Frightful Sight DSP and matted them with some Basic Black. I ran some Cajun Craze thru the Dotted Scallop Ribbon Border punch. I colored the witches hat with Old Olive and the socks with Basic Black and boots with Cajun Craze. All the stamps are from Wicked Cool. I also colored the sentiment with the same Stampin' Write Markers and then punched it out with the Small Oval punch, layering it onto a Cajun Craze piece punched with the 1 inch Circle punch. I popped that and the rectangular panel up with Stampin' dimensionals. Finally, some Old Olive 1/2 inch Scallop Dots Ribbon finishes it off. The base is Chocolate Chip card stock and I added some papers from the Holly Berry Bouquet Specialty DSP. I stamped the stockings from Stitched Stockings in Chocolate Chip and Real Red and used the Stocking Builder Punch to punch out the pieces. I popped up both stockings with Stampin' dimensionals. Merry Christmas from Season of Joy was stamped in Real Red and punched out with the Large Oval punch and layered onto a Real Red piece punched with the Scallop Oval punch. I also popped up the ovals with Stampin' dimensionals. Finally, some 1/8 inch Real Red taffeta ribbon finishes it off. This card uses a sketch and color combo. First, I used the Stamping 411 Sketch#219 here. And second, the Splitcoast Color Combination#339 here. The colors to use are Always Artichoke, Cajun Craze and So Saffron. The base is Always Artichoke and I ran that thru the Big Shot with the Houndstooth Textured Impressions Embossing Folder. I cut a square of the First Edition Specialty DSP and matted it with Cajun Craze. 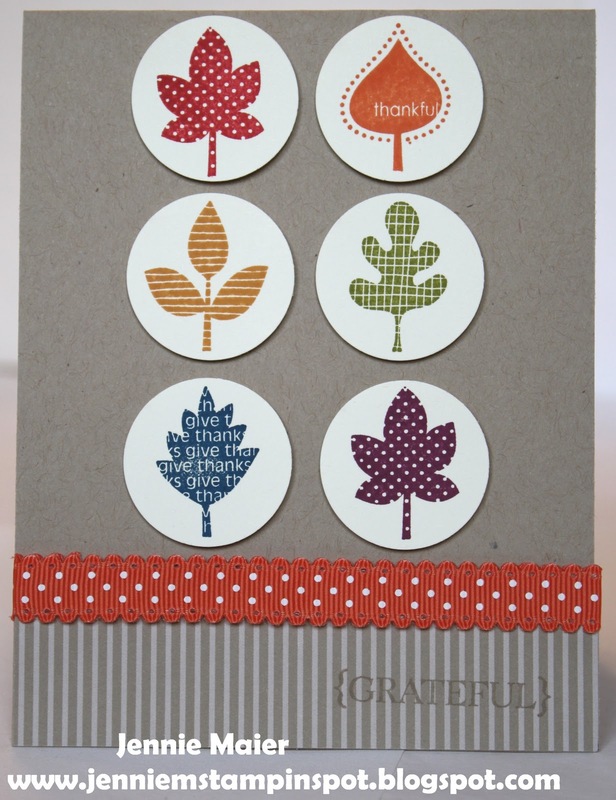 I used my Cajun Craze ink pad and Always Artichoke and So Saffron Stampin' Write Markers to color in the big image from Day of Gratitude, stamped it on Very Vanilla and cut it out. I popped it up with Stampin' dimensionals. I punched out three flowers with the Boho Blossoms punch, added a Gold brad to each center and popped them up with Stampin' dimensionals. I stamped thank you from Day of Gratitude in Always Artichoke and punched it out with the Word Window Punch. 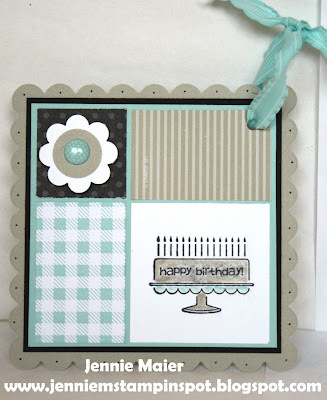 I made this card with the PPA Color Challenge#109 here. The colors to use are Basic Gray, Calypso Coral and Riding Hood Red. I also used the Clean and Simple Stamping FTL#156 here. The base is Basic Gray card stock and I added some DSP from the Patterns DSP Neutrals Stack. 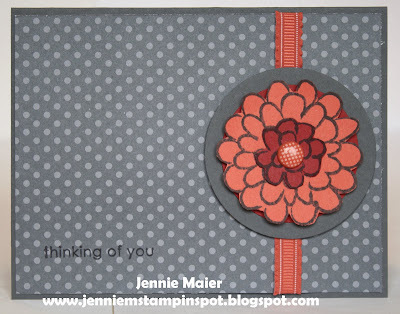 I stamped the flower from Flower Fest twice in Basic Gray, once on Calypso Coral and once on Riding Hood Red. I cut out the Riding Hood Red piece and added a Designer Printed Brad to the center. Behind the flower is a Riding Hood Red circle that was cut out with the Circles#2 Big Shot die. 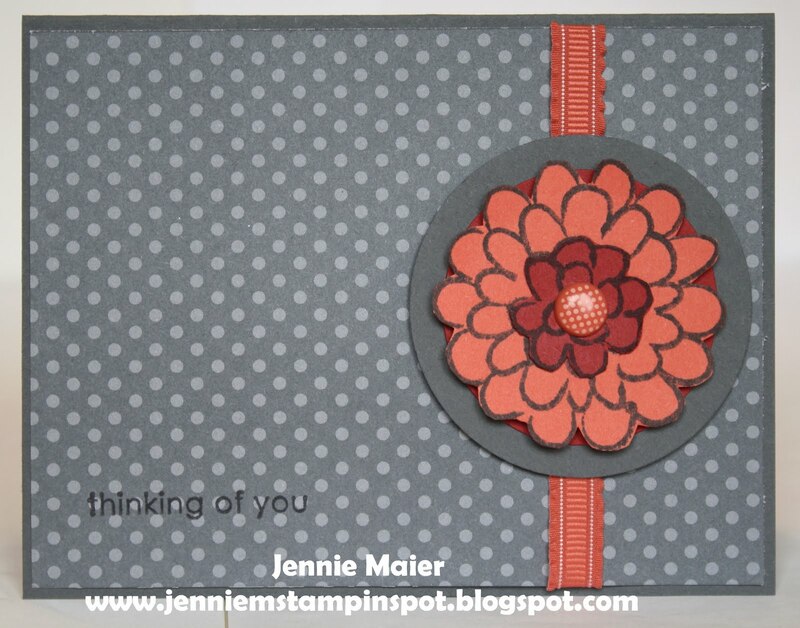 The Basic Gray circle was punched with the 2 1/2 inch Circle punch and popped up with Stampin' dimensionals. I stamped thinking of you from Trendy Trees in Basic Gray. Finally, some 3/8 inch Calypso Coral Ruffled Ribbon finishes it off. 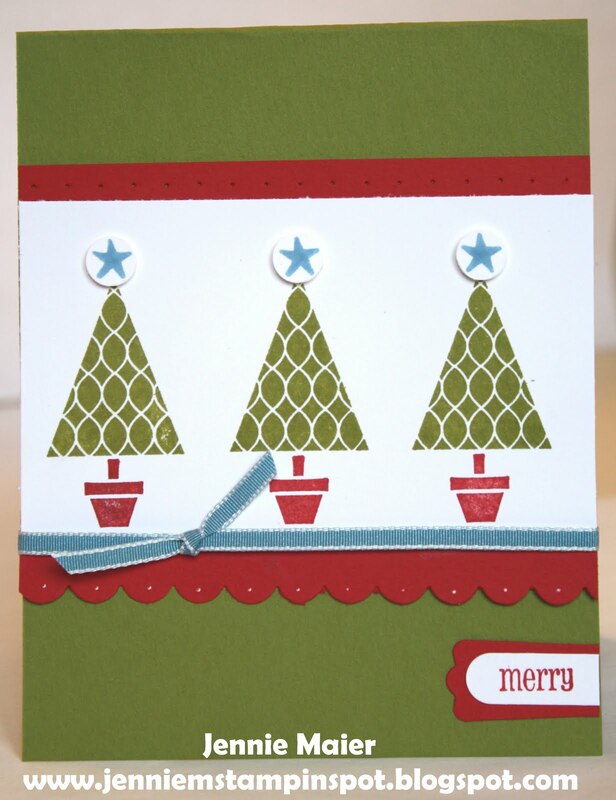 Here's another card that features a Holiday Mini item-the stamp set Out On A Limb. I used the Splitcoast Sketch#348 here, along with the Create with Connie and Mary Color Challenge#165 here. The colors to use are Rich Razzleberry, Pumpkin Pie and Lucky Limeade. The base is Lucky Limeade card stock. I added some Rich Razzleberry and Pumpkin Pie DSP from the Patterns DSP Brights Stack. Using the Out On A Limb stamp set, I stamped the moon in Limeade, broom in Pumpkin Pie and witch in Rich Razzleberry. I used my Pumpkin Pie Stampin' Write Marker to color in one of the pumpkins from that stamp set. I punched that out with the 3/4 inch Circle punch and layered it onto a Pumpkin Pie piece punched with the 1 inch Circle punch, popping up the circles with Stampin' dimensionals. 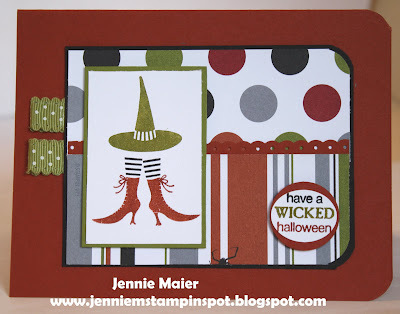 I stamped Happy Halloween from Teeny Tiny Wishes in Lucky Limeade, punched it out with the Word Window punch and layered it onto a Limeade piece punched with the Modern Label punch. Finally, some 3/8 inch Lucky Limeade Ruffled ribbon finishes it off. Today's the Day for the Holiday Mini Catalog! The Holiday Mini Catalog is live today so to kick it off I made a card featuring products in the Mini. I used the MojoMonday Sketch#206 here to get started. 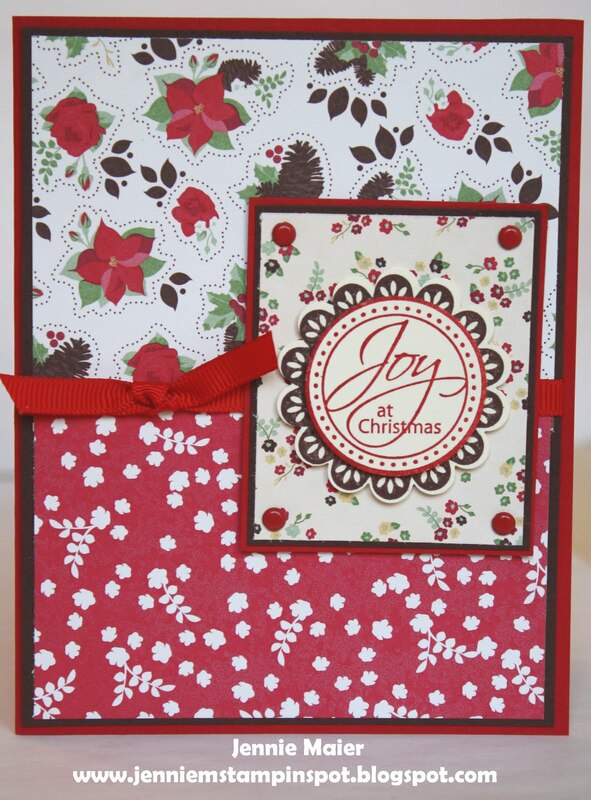 I have a Real Red card stock base then added three patterned papers from the new, Holly Berry Bouquet Specialty DSP. The dots and stripes on the paper have glitter! I ran the Very Vanilla piece thru the Big Shot with the new Snow Burst Textured Impressions Embossing Folder. I stamped the stocking from the new, Stitched Stockings stamp set in Real Red and punched it out with the new, Stocking Builder Punch. 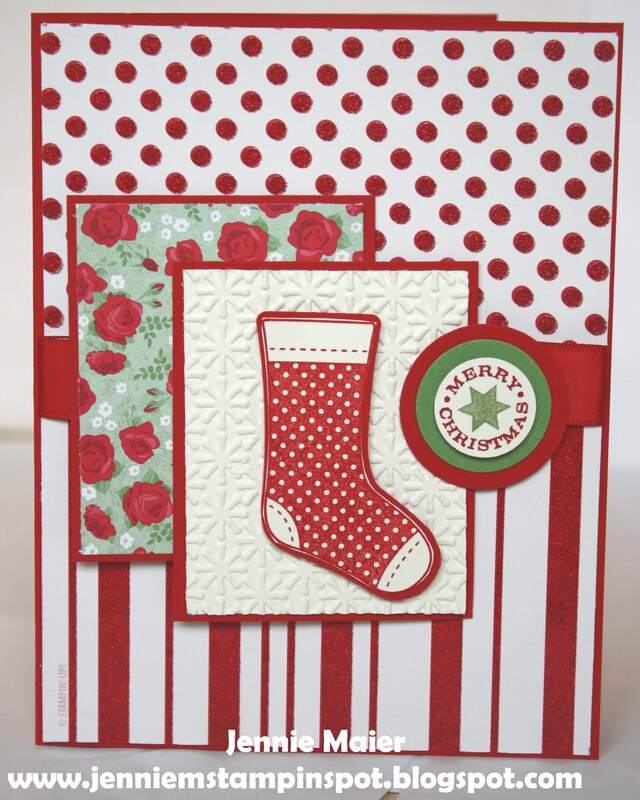 I trimmed down the stocking and added a Real Red piece punched with the Stocking Builder Punch. 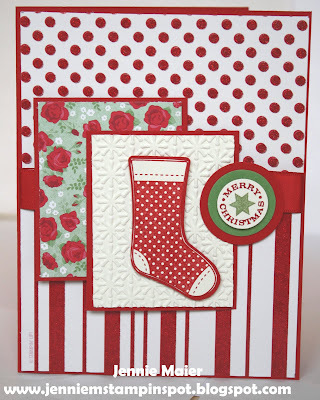 The stockings were popped up with Stampin' dimensionals. I colored in the Merry Christmas stamp from Delightful Decorations with my Real Red and Wild Wasabi Stampin' Write Marker and punched it out with the 3/4 Circle punch. I popped up that circle with Stampin' dimensionals. The Wasabi piece was punched out with the 1 inch Circle punch and the Real Red piece punched with the 1 1/4 inch Circle punch. Finally, some 5/8 inch Real Red Satin Ribbon finishes it off.